Gragnano is an Italian town near Naples, in Campania. It is known throughout Europe as the City of Pasta, and is indeed the city that produces and exports the largest amount of pasta in Italy. Gragnano pasta is also linked to 500 years of history with extraordinary companies. Amongs these is the Di Martino family, who has produced pasta in Gragnano since 1912. A tradition that has crossed three generations and continues through innovation; today Di Martino pasta is an authoritative reference point in the world market of Gragnano pasta. Here 8 million pasta dishes are produced every day, exporting the Italian tradition to more than 32 countries. Pastificio Di Martino has always made PGI Gragnano Pasta by mixing the best 100% Italian durum wheatsemolina together with the spring water coming from the Lattari Mountains. The extrusion of the dough through bronze die and the peculiar drying process at low temperature confer pasta a very rough surface, able to enhance the seasoning and keep the wheat aroma intact. And now a special news. 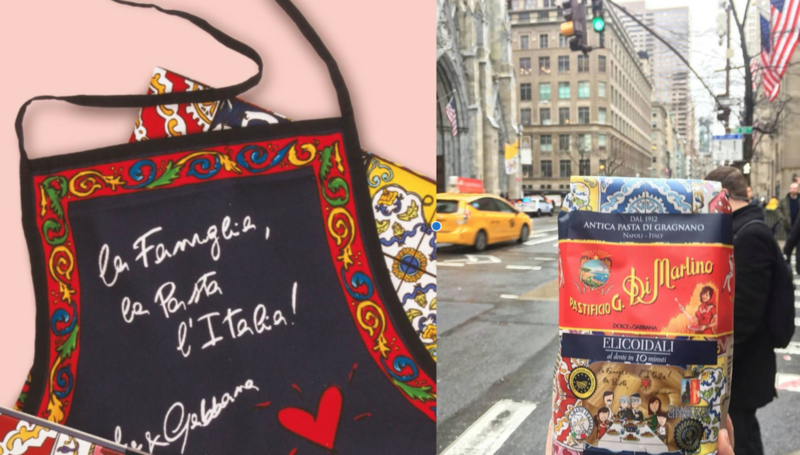 The Italian luxury fashion house Dolce & Gabbana partnered with the Italian pasta maker Pastificio di Martino to produce an extremely limited edition tin of pastas along with a special D&G-designed apron. 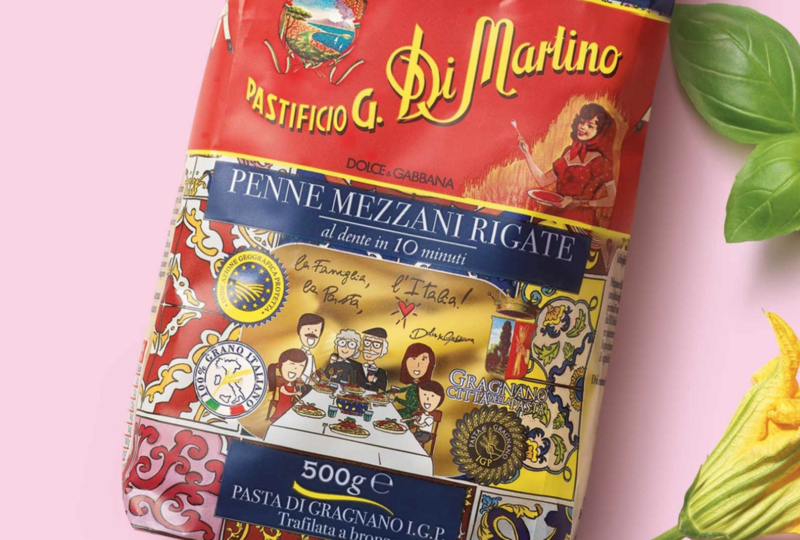 So Dolce & Gabbana has signed the new look of Di Martino pasta. A Special Edition celebrating the Italian excellence through the colours, symbols and monuments identifying the Country. The new packs have become real postcards from Italy, that are going to enliven and scent tables worldwide thanks to their lively Mediterranean design. 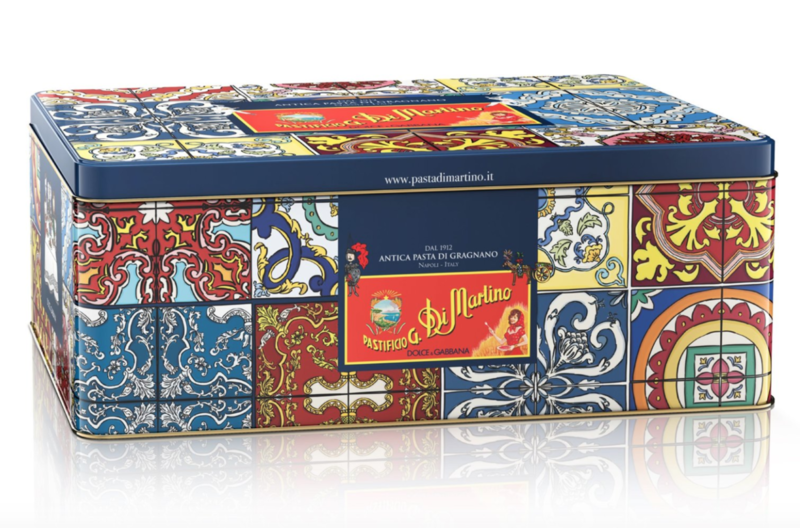 All the shapes leading the Special Edition and an apron designed by the stylists, together into a lively tin box. The most exclusive present for the Italian taste lovers.